In the Southern section Aldershot beat Oxford 2-0, Charlton beat Dagenham 1-0, Swindon won 3-0 at Southampton, and Exeter won 3-1 at Yeovil. Brentford won 1-0 at Stevenage, Torquay beat Bournemouth 3-0 on penalties, and Southend beat Gillingham on penalties - both after goalless draws. In the Northern section Hartlepool beat Northampton 4-0, Shrewsbury won 1-0 at Oldham, Macclesfield beat Morecambe 1-0, Port Vale beat Rochdale 2-1, and Rotherham beat Lincoln 1-0. Accrington beat Tranmere 5-3 on penalties after a 1-1 draw, and Chesterfield won 2-1 at Walsall. Two more matches take place on Wednesday, with Brighton taking on Leyton Orient in the Southern section and Sheff Weds facing Notts County in the Northern. Of the ex-Bulls on show, Matt Done scored Rochdale's goal after starting his first game for the club. Hereford United manager Simon Davey has commented about his two new signings Cameroon striker Amadou Rabihou and the German utility player Dominic Werling. "Amadou has looked very sharp in the time he's had with us and has a lot of experience playing against some of the best sides in Europe," said Davey. "He's six foot one - strong and quick and will give us an extra dimension in attack." The deal with Rabihou is until the end of the season. "Dominic is a left sided player who can fill many roles and this is what we've been looking for," said Davey. "I worked with him at Barnsley and feel he has the qualities and character which we need to make Hereford a real force." The length of Werling's contract was not mentioned by Davey in his comments which first appeared on the Official Website. The Worcester News said it was for two years. It appears that Simon Davey's new signing Dominik Werling has wanted to leave Darlington for several weeks. An alledged training ground incident probably sparked his request. On August 14th Darlington manager Mark Cooper spoke about Dominik Werling. "He wants to leave the club," Cooper told the Northern Echo. "He’s told us he wants to go back to Germany, apparently his mother’s ill.
"We’ll not let him go for nothing to an English club. "I think it’s important that we get that on record. "To be fair to the club they brought him in, they have paid for his accommodation but he wants to go. "Somebody wants him. If an English club wants him they’ve got my mobile number, they can ring me and I’ll tell them how much he’s going to cost." The paper went on to mention that Simon Davey was interested in trying to bring him to Edgar Street. Cooper knew he was unsettled. "He’s got a fantastic left foot, you can see he’s played at a high level," he said. "But that’s not what it’s all about. Football is also about attitude and commitment to the cause and at this moment he hasn’t got it because he doesn’t want to be here." Simon Davey has made two signings today according to the Worcester News. Werling, 27, (pic on right) has signed a two-year deal after buying himself out of his contract at Davey’s former club Darlington, while Rabihou (pic on left) has put pen to paper until December 31. Werling played for several clubs in Germany before moving to Turkey. 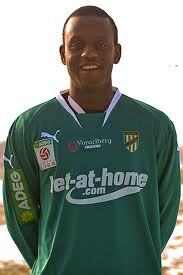 In July 2007, he joined Barnsley from Turkish side Sakaryaspor. On 3 September, it was announced his contract had been terminated by FC Erzgebirge Aue and that he could leave the team. Following a trial spell, which saw him score a goal in a friendly match against Blackburn Rovers, he joined Football League One side Huddersfield Town on 20 January 2009. 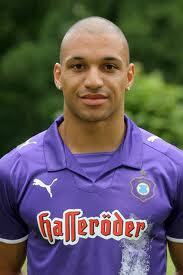 He made his debut as a substitute for Lionel Ainsworth in the 1–0 win over Peterborough United on 31 January 2009. At the end of the season, he was not offered a new contract and was released. On 28 April 2010, it was confirmed that Werling would be rejoining former manager Simon Davey at Darlington for the 2010–11 season. Rabihou began his career with AC Milan. In 2002 he moved to Austrian side SK Sturm Graz, where he made 65 appearances and scored 12 goals. In 2007 he moved to French second league team Amiens SC but couldn't settle and went on to Slovakian team FK DAC 1904 Dunajská Streda. He left them in January 2009, returning to Austria and signed for Austria Lustenau. He contract with them ended last June. Blackpool have confirmed the signing of Wycombe's England u19 man Matt Phillips for an initial £325,000. The total fee could rise to £700,000 plus a 'generous' sell-on clause. Barnet have signed striker Charlie Taylor from Sutton United for an undisclosed fee. The 24 year old scored 20 times last term for the Ryman Premier side. Cheltenham have signed Portsmouth midfielder Marlon Pack on loan for the rest of the season. The 19 year old has experience of the lower leagues with Wycombe and Dagenham. Lincoln have released transfer listed pair Chris Fagan and Shane Clarke. The Imps have also signed midfielder Adifane Noussoura until the end of the year. The 18 year old from the Reunion Island has been on trial with the club since pre-season. Oxford have signed Luton striker Tom Craddock for an undisclosed fee. The 23 year old ex-Middlesboro forward scored 31 times in 68 games for Luton. The U's have also signed midfielder Josh Payne on loan from Doncaster for a month. The teenager only signed for Rovers in the summer after leaving West Ham's Academy side. Plymouth have denied making a bid for Adam Le Fondre, with Rotherham owner Tony Stewart telling the press an offer was rejected 'in seconds'. Accrington appear to have failed in a bid to sign Nigerian trialist Alex Akande. The 21 year old originally started his career with Eastbourne, but has spent the last three years in Hong Kong. Stockport have begun to stem 'the rot' in the club by agreeing terminations with unwanted trio Gianluca Havern, Sam Hare, and Richie Partridge. The moves have allowed boss Paul Simpson to hand Robbie Williams a permanent deal after he started the season non-contract. Southend have signed full back Chris Barker on a permanent deal from Plymouth after he signed on loan at the start of the season. The taxman has raided Croydon Athletic after owner Mazhar Majeed was claimed by the News of the World to be using the club to launder money from his illegal cricket activities. It is understood that without Majeed's involvement the club have no way of paying their players. Torquay's home match with Barnet has been moved two days to Monday Nov 15th for live Sky coverage. The game may be cancelled if either club is involved in an FA Cup replay. Surrey based Darren Sheldrake is set to referee Hereford United's next League Two game which is at Burton this coming Saturday. It is his second season at this level. The Bulls met Sheldrake twice last season. Firstly at Edgar Street on September 1st when the Bulls defeated Bristol Rovers on penalties in the Paint Trophy. Jamie Tolley was booked. The second game was at Northampton on December 1st in what was probably the best away performance by the Bulls last season. Whilst Northampton scored first the Bulls replied with goals from Darren Jones, Mathieu Manset and Craig King. Both King and Jonnie Godsmark were booked. Sheldrake is set to referee his first match of the season at Southampton this evening (Tuesday). It appears that some Hereford United supporters are being offered special deals to continue their subscription to Bulls Player. The annual payment of £39.99, if paid by credit card, is being reduced to £29.99 for the next twelve months. This means that Bulls Player can be purchased for little more than 8p per day. Whilst Hereford United haven't published any figures on the take up of Bulls Player, recent info released by Perform suggested that around 12,000 subscribers across FLi (Football League Interactive) player sites have been listening to live commentaries each Saturday. Some 82 clubs are involved with FLi of which 66 are Football League sides. Therefore an average of around 150 supporters of each club listen to the commentaries each Saturday. However that figure of 150 is likely to be somewhat higher when their club is playing away. Burton Albion's Adam Bolder is set to miss next Saturday's League Two match against Hereford United after dislocating a shoulder in their game against Cheltenham last Saturday. "It was a bad dislocation, but the good news from the hospital was that there was no indication of any bone damage," said manager Paul Peschisolido. "We now have to wait and see what the scan reveals in terms of soft tissue damage. "Until we know that, it’s impossible to say how long Adam will be out of the side, though I don’t think there is much of a chance he will be available for the Hereford game." A 29 year old midfielder, Bolder was signed on a free from Millwall during pre-season. The Brewers lost the game 2-1. Former Hereford United captain Karl Broadhurst has left Telford without playing a match for the Shropshire team. Broadhurst started training with Telford the week of the recent friendly against the Bulls but didn't feature in that game. Later he did play in several other friendlies and subsequently signed non-contract terms. However he has failed to make a league appearance for them. Ex-Bull Joe Anyinsah goes to the same map shop as Wayne Jones. Leaving Carlisle to be near his Bristol home, the winger has ended up signing for Charlton. Joining him there is former Bulls target Paul Benson, with the Dagenham striker costing them a reported £250,000. Rotherham striker Adam Le Fondre is claimed to be the subject of a bid from Plymouth, according to Sky Sports. Luton manager Richard Money has apologised to supporters after being involved in an altercation with the club's own fans after Saturday's loss at Tamworth. Ex-Bull Nick Chadwick is to seek treatment at Lilleshall in a bid to cure a mystery knee problem. A number of scans and experts have failed to find the root of the problem. In today's Conference action Mansfield are the new leaders after a 4-0 win at Altrincham, with the Robins propping up the table four points short of everyone else. Crawley beat Forest Green 1-0, but both sides had two men sent off. Alan Connell scored ftwice as Grimsby beat Histon 2-1, and Kidderminster drew 2-2 with Tamworth. Wrexham rectified their recent poor form with a 2-0 win at Bath. Stockport boss Paul Simpson has taken a swipe at the club's former Administrators for leaving him with unwanted players on high wages. Simpson says there is a 'rot' in the club but he is powerless to stop it as he has no budget left to sign new players. Ex-Bull Sammy Igoe scored for Havant and Waterlooville as they drew with Eastleigh in Conf South today. Lincoln winger Albert Jarrett will miss their next two matches after he was called up by Sierra Leone for their match with Egypt next weekend. There is just one day left of the August transfer window, with the opportunity for club to club transfers ending at 5pm on Tuesday. After that clubs will have to wait a week before the 'emergency' loan window opens. Free agent players, those that have not been attached to a club since the window closes, can still move freely. The Bulls are expected to make some moves in the transfer market after a slow start in front of goal this season. Both the trialist strikers reported last week are believed to be out of contract and could be signed at any time regardless of the window. Any incoming loans and transfers would have to fit into the accepted squad budgeting allowed by the Football League. Six weeks ago, at the Radfords fans forum, David Keyte said the original playing budget was going to be based on gates of 2,200 but they were going to be more ambitious following supporter reaction to the new regime. Saturday's gate of under 2,200 will have given them some food for thought as to how far they push the boat out. The HUISA coach to Burton on Saturday will depart from Radford's at 11.00 am. Tickets are £14 for members and £16 for non-members. Seats can be booked through The Club office at Edgar Street (08442 761939). Former Bulls loanee Sam Hewson is on trial with Grimsby. The former Man Utd trainee is reported to be short on fitness as he hasn't had a full pre-season. Crawley are reported to have offered York £275,000 for striker Richard Brodie before signing Peterboro striker Ben Wright. Wycombe's England u19 international Matt Phillips is reported to be on the verge of a move to Blackpool. Phillips missed their weekend match with Northampton and was seen at Bloomfield Road. Barnet have announced that their Hive training facility will be used by Bulgaria as they prepare to face England. The Hereford United youth team were defeated 2-0 at Swansea yesterday. Colin Williams's side were pitched against former Bull Tony Pennock's team. Tony Pennock's charges scored two without reply against the Bulls with Thomas Da Silva and Adam Hurrell both on target in the first-half. Mat Gwynne made some important saves in the Hereford goal and the visitors came close as both Will Loughman and Laurie Marsh struck the woodwork. Pennock spent the 1994/5 season with Hereford. He had joined after a spell with Wigan. However during the season he made just 15 starts and became understudy to Chris MacKenzie. Rotherham manager Ronnie Moore has given his views on yesterday's game at Hereford. "I thought we played really well in the first half and thought we deserved to be in front," said Moore. "But, we were hanging on a little bit in the second half. "Hereford are a big side and they launched everything. I thought we defended well and we also had a bit of luck. Fleetwood got through and we've messed up but, overall, I think we just about edged it. "Andy Warrington made one or two good saves, especially late on when he made one with his legs, but that's what he's there for. They got a kick up the backside at half time and they've come out and he's made a great save, but I missed that because I was late out. But the last ten or fifteen minutes we couldn't get hold of the ball and we were camped in the edge of our box. "The most important thing is that we got the three points. We're going to get days when we play really well and don't win and days like today where you get a mixture and we come away with the points." Former Bulls keeper Wayne Brown got his South African career off to a losing start today. Playing for Supersport United as one of their five allowed foreign players, Brown conceded three times as the current Premiership champions - nicknamed the Swanky Boys - lost 3-0 to Bidvest Wits on the opening day of their season. Wits, formerly coached by ex-Bull Terry Paine, were forced to play the game in the Ellis Park stadium in Johannesburg due to their own ground being unavailable. The ground was, unsurpringly, empty. Their own ground holds 5,000, Ellis Park 62,000 for football. Brown appears to be keen to lure other English players to the country. Bury boss Alan Knill, his boss for the last two seasons, admitted in his post-match interview that striker Andy Bishop had been the subject of an enquiry from an unnamed South African side. It will be a slow start to the season for Brown. The club has just three matches scheduled for September, and only two for October, with January and Feburary the busy time in South African football. Theo Robinson wasn't even on the bench for Huddersfield as new striker signing Alan Lee started in their win over Charlton. Mark Marshall scored the equaliser for Barnet, and Glen Southam was booked, as they drew with Bury. Craig Stanley scored Morecambe's goal as they drew with Gillingham. Dean Beckwith was booked as Northampton drew with Wycombe. Mark Beesley was one of five booked for Fleetwood as they lost at Southport. David Brown was booked for Wrexham as they drew with Barrow. Andy Moran scored from the spot as Airbus beat Aberystwyth. Despite a barnstorming finish, Hereford failed to reply to a lone Paul Warne strike just before the interval. The Bulls barren spell now extends beyond seven hours, a source of much frustration for a disappointing crowd and for manager Simon Davey. O’Neil Thompson returned in midfield, and Mathieu Manset’s injury necessitated a reshuffle in attack. Rotherham received clearance for Jeremiah Ani to be named among the subs, and Ryan Cresswell was fit enough to start the game. Captain Kovacs was penalised for a push on Warne, and from the resulting free kick, the wall did its job in deflecting Kevin Ellison’s shot for a corner. Ellison and Thompson then had a frank exchange of views; a foretaste of the simmering tension which spoiled much of the later parts of the game. Cresswell’s push on Sean Canham then gave the home side a similar chance, but James McQuilkin’s floated free kick was powerfully headed straight at Andy Warrington in the Millers goal. Kovacs was called on to make timely clearances at the other end. Exodus Geohaghon’s long throws were proving difficult to clear, but despite one or two clever flicks, the home defence seemed untroubled by the prolific Adam Lefondre. Another McQuilkin free kick gave Canham a chance, but his header was comfortably saved, and Canham then fired straight at the keeper when played in by Stuart Fleetwood. The striker then almost made amends by charging down a clearance, but was hauled back by Exodus. Referee Mr Rushton kept his cards pocketed, choosing instead to deliver a lengthy lecture. Clear cut chances were at a premium, with a marauding run by Tom Newey expertly shepherded to safety by Ryan Green and some indecision almost letting Geohaghon in. Kovacs for once misjudged a header which flicked dangerously over the bar. Meanwhile Fleetwood beat one man to create a chance, but his effort was blocked. The crowd could almost taste the half time Ascari beef pie, and were planning their own exodus when the visitors took the lead. Lefondre chipped the ball over for Warne to nod goalwards as he tumbled. Despite getting fingertips to it, Adam Bartlett was not able to prevent the goal. The home team rejoined the fray with renewed vigour. Fleetwood bustled around more after a rather laconic first half showing, and his clever through ball found Canham, whose shot was cleared for a corner. McQuilkin’s flag kick found Thompson’s head, but the effort was woefully wide. A move involving Fleetwood, Ryan Valentine and Canham led to Joe Colbeck planting the ball beyond Warrington, but the linesman had already flagged for offside. Ellison was fortunate to escape a card after needlessly barging Kovacs from behind with the ball running out of play. The Hungarian reacted angrily and incurred Mr Rushton’s wrath as much as the original miscreant had. Shortly after this, the official started brandishing cards for much lesser offences. The flow of the game was interrupted by a series of niggly fouls, simmering disputes and some cynical time wasting, and these were not dealt with consistently. As a result, players became frustrated as the game entered a frenetic last 15 minutes. Fleetwood was through on goal with clearly the best chance the Bulls created, but his effort was skewed well wide of the post. Thompson, McQuilkin and Kenny Lunt all had half chances without troubling the Grecian 2000 rep between the sticks. A Green cross was too high for Fleetwood, but it fell invitingly for little Jimmy, however there were the legs of Warrington to, once more, block the path to goal. As the home side pressed for a leveller, Rotherham looked dangerous on the break, though they understandably saw the preservation of three points as their main objective. Despite much huffing and puffing, Hereford’s goal drought was set to continue for another day, and a drop to 16th place was not the best end to August. Attendance: 2166 with 212 from the Don Valley. HUFC: Bartlett, Valentine, Kovacs, Townsend, Green, McQuilkin, Lunt, Thompson, Canham, Fleetwood, Colbeck. ROTHERHAM: Warrington, Newey, Cresswell, Geohaghon, Holden, Harrison, Law, Taylor, Ellison (Bradley 87), Warne (Marshall 81), Lefondre. Former player Gareth Davies joined BBC H&W's Keith Hall at the commentary point at Edgar Street this afternoon. "I supported the club as a kid that's why I left Swansea City and how I'm friends with Simon as we were there together," said Davies. "I've always supported Hereford United, always been a fan, always will be and the club is close to my heart. "It's nice to see a lot of chances and I can see that things will move forward as a package not just with the first team. "It's nice to be back watching the team and hopefully playing a part in developing its future. However Davies sounded a note of caution. "Nothing happens in five minutes," he continued. "Having spoken to the chairman and Tim Russon it appears this is a long term project and this is about bringing the community back together. "I think the fans want to be part of the club. That's what a club like Hereford United is all about - or that's how I remember it." Asked what he does these days, Davies replied that he is working for the Welsh FA. "I'm a football development officer in central Wales. Quite a big area to cover." Davies then clarified his position as regards the Bulls. "I've just said to Simon and David that if there is anything I can do voluntarily for the club in the future that's all it will be. "There's no job, it's just me being a supporter and an ex-player. "The club gave me my career and if I can give anything back for free then I will do." Below are the main stats from this afternoon's League Two match at Edgar Street where Hereford United were defeated by Rotherham. Torquay lost their clean sheet record but take up the mantle as bookies favourites after winning 2-1 at Port Vale. Shrewsbury are second after winning 4-0 at Stockport, who drop into the bottom two. Rotherham are third, level on points with the Shrews, with Chesterfield fourth on eight points after drawing 1-1 with Macclesfield. Port Vale and Cheltenham are on seven points with the Robins beating Burton 2-1, and Accrington are the first of three sides on six after drawing 0-0 at Oxford. Wycombe drew 1-1 at Northampton, and Aldershot drew 1-1 with Stevenage to also be on six points. Down the bottom Barnet recorded their second point of the campaign with a 1-1 draw with Bury. Lincoln and Crewe also drew 1-1, as did Morecambe and Gillingham. In the Conference Wimbledon are top after winning 3-2 at Eastbourne. Crawley won 3-0 at Hayes and Yeading, and Rushden beat Grimsby 4-1. Kidderminster lost 3-0 at Newport, and Forest Green and Bath played out a goalless draw. Wrexham could only manage a draw 1-1 with Barrow. Simon Davey told BBC Hereford and Worcester that he wasn't happy with the performance of the referee at Edgar Street this afternoon. "Second half there was only one team in it. We created chances but we couldn't put the ball in the back of the net," said the Hereford United manager. "When you get 18 chances you've got to be scoring goals. They had one chance and scored it. "We've had three penalty decisions go against us yet again. "As soon as they scored the goal I mentioned to the referee thay they were going to try and slow the game down. "It wasn't until probably 25 or 30 minutes of the second half that he booked somebody (the goalkeeper). "The referee didn't handle it well. He's got three terrible decisions wrong." Stuart Fleetwood missed a sitter. "Got to score. That's what he gets paid for. When you through on goal you've got to score." O'Neil Thompson was back in the side. "He started slowly in the first half but I thought he came into the game second half. Another one who had two or three chances that he should have put away. "At the moment that's the story of the group. They can create, they can pass, they can compete but they haven't finished off the goals." The Bulls ended today's match with Rotherham throwing everything but the kitchen sink at the opposing goal, but went down 1-0 in today's League Two fixture. The final 15 minutes was virtually one way traffic as the Bulls banished a drab first half performance with a fast paced attacking display in the second period that had everything bar the bulging net. A frankly disappointing attendance of 2,166, with a couple of hundred Millers fans, saw referee Rushton hand out nine cards as the crowd suffered another poor display from the man in black. Rotherham United captain Ryan Cresswell has travelled with the squad to Hereford but faces a late injury test to see whether his neck problem has cleared up sufficiently to allow him to play this afternoon at Edgar Street. Defeneder Cresswell is the Millers captain and manager Ronnie Moore will be hopeful he can play. Moore has several other injury concerns in his squad so Johnny Mullins, who is yet to start this season, has also travelled with the squad. Striker Tom Elliot is also a doubt with a thigh strain. With no game for the Bulls on Monday, today is the only chance Hereford United supporters will have to watch their team this Bank Holiday Weekend. Rotherham are the visitors to Edgar Street this afternoon. Their last game was a ten goal thriller and the Millers came out top with a 6-4 win over the Robins. Whilst we might not see ten goals today, both sides can play free flowing football. And with the weather promising to be dry and bright, ground conditions should be perfect for a good game of football. The Bulls are expected to have mid-fielder O'Neil Thompson back from his injury but striker Mathieu Manset will be missing from the starting line-up. Supporters are reminded that the under 10's can watch for just £3 if accompanied by a full paying adult. And they can pay on the gate. Whilst the gates don't open much before 2pm, Radfords will be open from 12noon. With beer and cider as low as £2 per pint it is the perfect location for a pre-match chat or a place to watch the early match on Sky which is Blackburn versus Arsenal. And there's no need to buy food outside the ground any longer as Hereford based Ascaris now run the refreshment kiosks inside Edgar Street. The fare, locally prepared, is much better this season than at any time during the Lindley era. So why not turn off the radio, put the computer on standby and come and watch live football at Edgar Street this afternoon. The game kicks-off at 3pm. Meanwhile in the first League Two game of the weekend at the Valley Parade Southend defeated Bradford 2-0 last night. Earlier today Hereford United revealed that a new temporary stand would be erected on the Blackfriars End at Edgar Street. It will seat 650 away supporters. The stand will be ready in time for the visit of Oxford United on September 11. It will probably be used for several other games, such as Shrewsbury, when the away following is expected to be more than around 600. Currently there is space for some 233 away supporters in the Len Weston terrace with 430 away supporters seated in the elevated section. With the new stand 1313 away supporters will be able to be accomodated at Edgar Street. The stand is a temporary measure until such time as the Blackfriars End is re-developed which looks as though it will not be until next May at the earliest. Away supporters will pay the same to sit in the new stand as in the terrace given it will not be covered. This is just a short reminder to anyone wishing to enter the Bulls News Prediction League this weekend when Hereford entertain Rotherham. As always, send your score and attendance predictions to bullsnewspredictions@hotmail.co.uk . Please remember to include your chosen username. Speaking to their official site, Rotherham boss Ronnie Moore was wary of the height in the Bulls squad: "They've got six guys who are six feet four plus and so we know we've not got to give away too many corners and that we've got to be disciplined in and around the area. "And we'e got to defend a hell of a lot better than we did on Saturday because if we defend like we did on Saturday we will get beat. We need to get back to the way we defended at Morecambe the week before which was fantastic. "Simon Davey knows the game inside out and his team will want to play and be competitive and I think he's done a fantastic job. He was unlucky at Barnsley and I wish him all the best but we want to take three points of them on Saturday." Meanwhile the Bulls are to put a temporary stand on the Blackfriars End to allow more Oxford supporters to see the game between the two sides on September 11th. The uncovered stand will be placed on the flat surface at the front of the current stand, and will be used exclusively for Oxford supporters. The Nigerian striker was due to make an appearance at Edgar Street at the end of July, but apparently opted for a trial with the Millers instead. It has taken him a month to secure a contract after playing twice in pre-season for them after Notts County opted not to sign him. He will boost their currently limited striking options. Fellow forwards Ryan Taylor and Tom Pope are both still out with foot injuries, leaving Leeds loanee Tom Elliott as the only recognised fit striker to partner Adam Le Fondre. 20 year old Elliott has only started 14 League games in an assortment of loan spells over the past 18 months and has scored only once, but he has been struggling with a thigh strain over the past week. The Millers retain an interest in signing Tranmere man Ian Thomas-Moore, and have placed a £30,000 bid with the Prenton Park outfit. Thomas-Moore has been stripped of their captaincy, but also has been offered a new deal, but he appears intent on joining his father as a player for a second time. Crawley have spent money on another player, this time Peterboro forward Ben Wright. The 22 year old scored a hat-trick on loan at Hayes and Yeading on Tuesday night, and is reported to have turned down a northern League Two side to sign for the Red Devils. They are also claimed to have made a 'Conference record' bid for a striker on Tuesday, and also to have rejected a £250,000 offer for Matt Tubbs from a League One side saying he is worth £700,000. Bromsgrove have been formally expelled from the Zamaretto League after failing to appeal against the expulsion decision. Vans were seen at their Victoria Park home on Tuesday stripping fixtures and fittings from the ground including the goalposts. New club Bromsgrove Sporting are due to take charge of the ground, but are having to groundshare temporarily. Southend are to open talks with loan defender Chris Barker over a longer stay. Accrington have signed Tranmere striker Terry Gornell. The 20 year old scored four times in 11 games on loan at the Crown Ground in late 2008, and has started three games for Tranmere this season without scoring. Stanley are to also open talks with midfielder Ray Putterill to extend his deal past January after impressing in the five games so far. Gillingham have extended the deal of midfielder Stanley Aborah for another month after the first month was wrecked by injury. Southend have loaned teenage striker Harry Crawford to Dover for a month. Crewe want to sign a full back before Tuesday's transfer deadline. Cheltenham have loaned teenager Josh Emery, son of ex-Bull Steve, to Cirencester for a month and want to extend the loan of Coventry striker Shaun Jeffers for a second month. Shrewsbury defender Danny O'Donnell is to miss a month as he need surgery to cure a hernia problem. Hereford United are 7/4 to beat Rotherham tomorrow. Most bookies are quoting similar odds, however Rotherham to win can be found at 17/10with William Hill. As regards first goalscorer Rotherham's Adam Le Fondre is at 4/1 with Corals, Tom Elliott 8/1 with Bet 365, Jerry Ani (if he plays!) at 8/1 also with Bet 365. For Hereford, Stuart Fleetwood is at 8/1 with Ladbrokes, Sean Canham and Mathieu Manset (again should he play) are both at 9/1 also with Ladbrokes. Simon Wright profiles Hereford United's new goalkeeping coach. Russell Hoult Hoult Hoult .. There are some people who are so instantly charismatic and charming that you cut them more slack than the average Joe. Russell Hoult sits within that bracket. Chatty, outgoing, and articulate it’s easy to imagine that Tim Russon will be exploiting his media-friendly nature to the full. Get in there Mr Hall. And he knows a bit about football in his long nomadic career does “Hot Dog”. Heavens he’s been around oh at least a dozen clubs – Pompey, Derby, Leicester. Lincoln, Notts , WBA etc etc. The old cliché “wealth of experience” is surely not far away. Note the central England nature of his club (Pompey excepted) so as not to stray too far from his Derbyshire base. More recently however due to domestic circumstances I was told he had a house in Tividale in the Black Country – an unlikely location for any footballer - other than those playing for Tividale FC. I have tried to follow his career post Hawthorns such as it was. Now that he seems to have run out of clubs, coaching is probably the obvious next step for a man who’s spent his whole life in the game. I suppose time has caught up with him – I imagine he’s close to 40. Can he coach? Who knows – this must be his first appointment. I recall Hoult at his peak as an excellent all-rounder. He was a first rate shot stopper, had a decent kick but most importantly was dominant in the air. It’s fair to say he was one of the most popular Albion goalkeepers ever. He does hold the club record for the least number of goals conceded in one season. There were mentions of an England call-up but Hot Dog was probably one Premier League season away from achieving that goal. My strongest Premier League memory was bizarrely a rather negative one. The now Burton Albion captain Darren Moore’s backpass was too short and Hoult had to bring down Michael Owen to prevent a goal. He was sent off. Russ likes women. Most blokes would say the same but his liking is or was so intense that he did several unprofessional things which became rather public. Shall I say this “influenced” at least two of his moves in my humble opinion. I won’t go into detail – look them up if you must as it’s all in the public domain– as I said I like the guy. Why Hot Dog? He made his League debut at a very early age at very late notice. The first choice keeper was suddenly unavailable an hour or so before kick-off (can’t remember why) and the word went out to find young Hoult. He was found nearby munching a large hot dog safe in the knowledge he wouldn’t be playing. Rotherham Football Club, who visit Edgar Street on Saturday, are currently without a permanent home. However plans are in hand for a new stadium. This week they have submitted plans to their local council for a 12,000 capacity stadium close to the town centre. Luckily they have already purchased a near-by site for car parking. Currently they are playing at the Don Valley athletic ground. Meanwhile the club has confirmed the signing of Nigerian striker Jeremiah Ani. However it is still unclear whether he will be able to play against Hereford on Saturday as he has to have international clearance. Russell Hoult has been confirmed as the new Hereford United goalkeeping coach. A former West Bromwich stopper Hoult was with the squad at Chesterfield last Saturday. Leicester born Hoult started his career at his home club in 1991 but was loaned out to several clubs before being transferred to Derby County in 1995 for £200,000. He made 108 appearances for the Rams before joining Portsmouth firstly on loan. He was transferred to them in late 2000. After that season he moved to West Bromwich for £450,000. Whilst with West Brom he was watched by then England manager Sven-Göran Eriksson. He left West Brom in January 2007 and signed for Stoke the following August. Later he moved to Notts County and had a loan spell at Darlington. Simon Davey has told the BBC he has two strikers in on trial. "He has got a lot of experience behind him but it would take time to get international clearance so there is no rush to make that decision. I will have a look at the two of them in the next two practices and see how they cope with the training. "I am looking at options and I won't stand still so if I think we need to add to the squad, I will go to the chairman and say 'I think we need to do this'. He is a chairman who is very understanding and who sees what I see. "Sometimes people panic and look at the statistics a little too closely. We had Stuart Fleetwood hit the post at Chesterfield, and Sam Malsom hit the post against Colchester. The chances are being created - I would have a little bit more concern if we had been conceding goals left right and centre and we weren't creating chances. "The way we play we will always create chances so it is only a matter of time before the strikers start popping those goals into the net." Former Bulls loanee Matt Murray has ended his career after admitting failure in his bid to overcome a knee injury. The 29 year old missed the entirety of the 07/08 season before joining the Bulls on loan from Wolves in November 2008 in a bid to get match fit for their promotion campaign. He started three games for the Bulls, but his knee crumpled after kicking the ball during the second half of a game with MK Dons and he never played first team football again. He also made his Wolves debut against the club known as MK Dons, albeit they were called Wimbledon back then, in 2002 but he managed just two full seasons in the eight since his debut and made just 106 first team appearances in total. This morning's Hereford Times has followed up the story that appeared on BN and elsewhere last weekend which suggested that Hereford United supporters were the third most unhealthy fans in the League. Recently local company Ascaris have been given the catering contract at the ground instead of the unloved Lindley Catering. "We as a football club are keen to have our fans as happy and healthy as possible and anything we can do to improve things we will," said Tim Russon, the Hereford United vice-chairman. "Ascaris is a more healthy option than previously in that the food is freshly prepared and locally made. "We believe we have made a positive step forward." Well-known supporter and farmer Rob Powell said he was surprised at the survey's findings. "Now Ascaris has taken over the ground catering, what could be healthier than a locally-produced Herefordshire beef pie." Hereford United striker Mathieu Manset, the Beast, is a doubt for Saturday's home game against Rotherham. He has a hamstring problem. "Manset did not train on Tuesday and we're yet sure of the extent of the damage," manager Simon Davey told the Hereford Times. Two other players are also on the injured list. Sam Malsom has a medial knee ligament problem and youngster Aidan Thomas an ankle injury. "Sam Malsom is probably looking at two to four weeks out," said Davey. "We still have Stuart Fleetwood and Sean Canham but whether we have to bring anyone in from outside will depend on the extent of the injury to Manset." Barnet chairman Tony Kleanthous has told their official site that he will look to move the club's home to their Hive training base near Edgware if they are unable to progress with the development of Underhill or a new ground within Barnet within the next four years. He says that he will have spent 20 years by then looking for a suitable site, but the council have blocked his moves. Southend have failed to pay fans the refund their promised their early season ticket buyers if they got relegated last season. A large number of fans are owed £80 each on the season tickets they bought at League One prices, with the Shrimpers telling fans that they will get cheques sent out by the end of this week, nearly a month after it was promised. Notts County have turned down a loan approach from an unnamed League Two side for ex-Bull Karl Hawley. Wrexham say they have confidence in manager Dean Saunders despite fans calling for his head on Tuesday night. They threw away a two goal lead to draw 2-2 with Kidderminster after losing sucessive games to part-timers Forest Green and Eastbourne to leave them six points off the pace after just four games. The company behind the streaming of live commentary on Bulls Player has given an explanation to webmasters of the problems they encountered last Saturday when many subscribers were unable to listen to the commentary from Chesterfield. Please find below a explanation of the issues that were experienced by Perform on Saturday afternoon. This explanation was posted on Club Central on Monday but this email is to ensure that all communication channels are covered off. At 2.40pm we started to experience major log-in issues to FLi Player and the Toolkit. Our software engineers identified a serious issue with the DNS server, that is effectively the piece of hardware that manages much of the communication around our infrastructure platform (importantly it would send user/CMS data to the Oracle database to verify and authenticate subscriber information). At 2.58pm we restarted the DNS server and this allowed users for a ten minute period to log-in to FLi Player sites. Positively this captured the vast majority of subscribers looking to log-in. Across FLi, we were peaking at 12,000 commentary streams which is in line with the end of last season and the first Saturday of this season, but marginally down (10% on last week). Our customer service enquiries were only marginally higher than a usual weekend, which proves we were lucky to capture the vast majority of users in the first 10 minutes of the game (when most people log in). The DNS server then started to fail again at 3.10pm, which meant log in to Player was intermittent from 3.10pm to 3.45pm. Our engineers identified what the route cause was at 3.40pm which was a log of communications that was blocking the authentication process. The core system DNS was fixed and fully functional during half time to allow seamless log in to both the tool kit and Player. Obviously we have had a number of queries from subscribers who were affected. In all cases we have offered to extend their subscription by a week or month to alleviate any customer dissatisfaction. Sincerest apologies from all at Perform and we appreciate the undue work this will have caused you. Former Hereford United goalkeeper Tony Elliot has been appointed as goalkeeping coach at Darlington. Elliot was a former England youth international keeper who joined the Bulls in 1988 from Birmingham. He made 75 appearances before moving to Huddersfield in 1992. He will work three days a week at Darlington. The Bulls entertain Rotherham on Saturday in a League Two match at Edgar Street. It will be only the seventh season that the Bulls and Millers have met in the Football League, and the third time in four years. In those more recent meetings the Bulls are unbeaten, winning two and drawing two of the clashes so far. Last time out, the Bulls were 3-0 winners at Edgar Street on the last day of last season in May. Mathieu Manset, Darren Jones, and Marc Pugh scored that day with the Millers looking a shadow of the side that had just secured a play-off spot. The Bulls are looking for a first home win of the season, and a response to the 4-0 drubbing received at Chesterfield last weekend. The harsh scoreline seems even harsher when the Spireites' keeper was named in the Team of the Week, but a more experienced ref could well have red carded him, and his Sean Canham punching team mate, and the result would have been entirely different. Regardless of that, the Bulls have to be more lethal in front of goal as the current record of one goal in four games is beginning to be embarassing. Rotherham go into the game with increasing speculation regarding the future of top scorer Adam Le Fondre. Four goals last weekend only heightened talk on his future, but boss Ronnie Moore is more intent on finding him a regular strike partner at present. With moves for son Ian Thomas-Moore and Plymouth man Rory Fallon failing, the Millers have turned to former Bulls trialist Jerry Ani. His last playing appearance at Edgar Street saw him score in a Bulls shirt but fail to earn a deal despite earning praise from the fans in attendance. Hereford United vs Rotherham United, Edgar Street, Saturday 28th August, 3.00pm. The funeral of former Hereford United striker Adam Stansfield takes place at Exeter Cathedral this afternoon. A very large congregation is expected and the service may have to be relayed outside. There have been many tributes to Stansfield. Another one apprears in this morning's Mirror written by Oliver Holt. In it Holt suggests that it's players like Stansfield who have a connection with fans that many 'rootless millionaires' from the Premiership will never have. A little boy had written a tribute to his hero and placed it carefully among the sea of flowers and football shirts strewn across the Big Bank. He had put his card in a small blue frame and laid it lovingly on one of the shallow steps of the terrace at Exeter City's St James' Park ground. He had begun with a formal heading and underlined it. "Stanno - 1978-2010", it said. Underneath, he had written out his meticulous message. "Adam," he had written with heart-aching neatness, "you were such a great player for all your teams. You were my favourite player and you always will be. You will never be forgotten. My favourite goals were the 2 you scored against Southend United." Then he had signed it. "Josh Gilmour (Age 10)," it said. "A massive City fan." Holt wrote that the messages left to Stansfield, who recently died from cancer, told much about the footballer who was 'one of the icons of the lower leagues'. "Adam, you were my favourite Red Army player," a lad called Thomas Prout had written alongside a picture he had had taken with Stansfield. "Thank you for sending me a birthday card each year. I shall remember the good times I spent with you when I was mascot. I will miss you so much." It was a mark of the man how Stansfield was at Exeter's first few days of pre-season training. "It was a gesture that showed everyone he was still around," said Steve Perryman, Exeter's director of football. "He trained and then he was bombarding the manager, Paul Tisdale, with questions. He wanted to know all about the team. What combination of strikers the manager was going to use, who was looking sharp, what the prospects for the new season were. "He was ill again by then but I'm not surprised he did the session. Stan was a runner. He pulled the rest of the team along. The more tired he was, the more he ran. He was the engine of our train." Holt summed up the Stansfield. 'Stansfield did not live in a flash house or drive a flash car. He lived on a nice, neat estate in the Devon town where he was born and he played out his career in the Conference and Leagues One and Two with Yeovil Town, Hereford United and Exeter. 'The reaction to his death, the way that it stunned the city where he played, emphasised again that the small clubs struggling to survive in England's lower leagues are still central to the identities of the communities in which they are based. 'Clubs like Exeter have had to fight tooth and nail for their very existence and men like Stansfield, who helped to lead them back into the Football League, have established a bond with their communities that most Premier League stars never will. David Brown scored his first goal for Wrexham as they raced into a six-minute two goal lead against Kidderminster, but it ended 2-2 with Lee Morris starting only his second game for Kiddy. Moses Ashikodi came off the bench to equalise for Kettering in their 1-1 draw at Mansfield. Craig Stanley was booked as Morecambe dipped out of the Carling Cup, 3-1 at home to Burnley. Nicky Nicolau scored Dover's second as they won at Ebbsfleet. Hereford United reserves were defeated by Coventry this afternoon in a behind closed doors game played at Ryton. Simon Davey took charge of the Hereford team. The Coventry City-Mad site have reported that Coventry scored twice but, as yet, it's unclear whether the result was 2-0 or 2-1. Update Thursday: The score was 2-1 with the Hereford goal scored by a 'foreign' striker. Next up for Hereford is the visit of Rotherham this coming Saturday. This spells round four of the Bulls News Prediction League. Will you back Hereford, who defeated the Millers 3-0 at Edgar Street on the last day of last season? Or perhaps you'll take note of Adam le Fondre, who scored four times last weekend in Rotherham's thrilling 6-4 victory over Cheltenham. Either way, entering the Prediction League is easy. Simply send in your score and attendance predictions to bullsnewspredictions@hotmail.co.uk. Please include your chosen username. New entrants are always welcome. The deadline for this particular game is 3.00pm on Saturday 28th August. Southend chairman Ron Martin has had allegations of sexual assault against him dropped, and he is now considering whether to take legal action for defamation against the accuser. Histon have named David Livermore as their new manager. The 30 year old, who ended last season with Barnet, is the son of Doug, the former Spurs coach. Accrington backer Ilyas Khan says he will increase John Coleman's playing budget after their stormy board meeting at the weekend. Reports saying Dave O'Neill had quit the club still haven't been confirmed but millionaire Khan says the club are to seek a move from the delapidated Crown Ground. Rotherham striker Adam Le Fondre is said to be attracting the interest of Coventry, Ipswich, and Derby but manager Ronnie Moore says he has had no bids. Gillingham won't be taking up their interest in former Charlton defender Grant Basey after he trained with them last week. Rotherham have signed former Bulls trialist Jeremiah Ani on a one month contract. The Nigerian striker, who has played in half a dozen different countries, has u17 and u23 honours for his country. After the problems suffered by Bulls Player subscribers last Saturday when many couldn't hear the commentary from Chesterfield, the Perform Group, who ultimately control the service, are offering one extra week free of charge. We apologise for the loss of commentary. As a gesture of goodwill we have extended your subscription by one week. At the time of writing it isn't clear whether this offer extends to all subscribers of Bulls Player or just those who have complained to the Perform Group. Representations to the Perform Group were made by the Hereford United website team last Saturday about the problems which affected many other clubs as well. "We have requested refunds for all subscribers to Bulls Player this month," said Jamie Griffiths from the website team. Staffordshire referee Steve Rushton has been picked to officiate Saturday's match at Edgar Street against Rotherham. The second generation ref, his father was also a Football League man in black, is in his second season as a FL ref. Last term he officiated at Edgar Street in the FA Cup match against Sutton, sending off Mathieu Manset, and also made an appearance in the League against Accrington. The Bulls won both matches 2-0, and didn't receive any of the five yellow cards handed out. This term, he has officiated in four matches. He opened his season up the A49 sending off the Shrews' Kevin McIntyre, and had issued two red cards and nine yellows in total. Meanwhile there are no Bulls in the Team of the Week. Opponents Chesterfield had three named in the XI including goalkeeper Tommy Lee, suggesting the game really was not as one-sided as the score indicated, while Crewe also had three players named. Tickets for the Oxford match on September 11th are now on general sale. The remaining tickets will be on sale until Sept 10th, or until they are sold out. No tickets will be sold on the day. The tickets are on sale from the Club Office. Stevenage have signed striker Njazi Kuqi. The 6ft 4in Finn, brother of current Swansea man Shefki, had been playing in Germany's second division. Torquay need to survive another 143 minutes without conceding a goal to set a new Football League record. They face Port Vale at Vale Park before travelling to Southend in order to set the record. Port Vale's board is claimed to have voted 5-3 against Mike Newton's investment offer. Newton has called their rejection statement 'one long round of excuses' and called it ridiculous that he didn't have the money. Notts County say that the vast majority of the £326,000 they are being sued for by a law firm is from work done for previous owners Munto Finance, not for the club itself. They meet in court on Thursday. Southend manager Paul Sturrock believes his players didn't deserve their wages after losing 3-1 to Port Vale and, with the Shrimpers' record on payment, they probably won't get them anyway. Police in Oldham are hunting two suspects after arsonists caused an estimated £40,000 damage to a function suite and disabled facilities at Boundary Park yesterday afternoon. 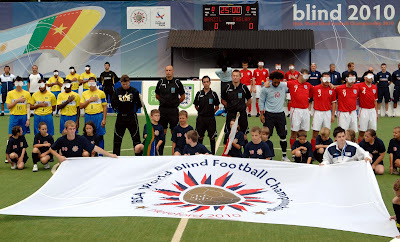 England were defeated 1-0 by China in the play-off for third place in the Blind World Championship at Hereford this afternoon. After the game former Hereford United player Tony Larkin who was in charge of the England team summed up their performance. "We were unlucky not to finish up with a medal," he said. "We are a young side and finishing fourth in a World Cup is fantastic achievement for everyone involved." Brazil won the final 2-0. The local Accrington press is reporting that managing director and, once the deal is eventually done, club owner Dave O'Neill quit the club at last night's board meeting. The meeting was to have seen O'Neill installed as the new owner and Chairman and benefactor Ilyas Khan leave the board but it now appears that Khan has handed control of the club to chief executive Rob Heys. Torquay have announced that they have rejected an offer from a League One side for central defender Mark Ellis. The 21 year old former Bolton trainee established himself as a first team regular only in February. Barnet boss Mark Stimson says his side will put their hands in their pockets to donate money to their supporters club to compensate fans for watching their 7-0 demolition at Crewe. Bournemouth are expected to sell striker Brett Pitman to Bristol City after he turned down personal terms at Blackpool. The Premier newcomers are reported to have offered the striker a low starting wage with substantial increases based on appearances. Histon say they will not be going into Administration. They say their players and the club secretary are the only members of staff to be paid following the departure of manager John Beck. Southend have rejected trialist strikers Izale McLeod and Elvis Hammond. Neither are 'up to the required standard' according to boss Paul Sturrock. ....this one from a Chesterfield fan. Y'know, at some point this season we're gonna endure a game where we have significant possession, create a string of opportunities, but nothing will go in whilst our opponents grab an arguably undeserved victory. Then we can think back to the Hereford game, slowly nod our heads and say "ahhh" with a knowing smile on our faces. Frankly, the hundred or so visitors yesterday afternoon must've left the ground feeling as though they'd been mugged. I thought he first half was pretty even, with Hereford looking to play off the big lad up front whilst we adopted a more fluent approach, and it was probably the fact we possessed more nous/extra quality in the final third - allied to a fingertip save from Lee - that made the difference. Certainly if Janos (to name just one of the visiting players that failed to convert) had been more accurate things might've been a great deal different. Two-nil to us, but without really dominating. Then, the opening fifteen or so minutes of the second half saw us doing our best to hand Hereford at least a share of the spoils. A penalty save (or a poor effort from their chap: you decide), a goal-line clearance, almost constant pressure and a succession of near misses had Town fans sweating, however then we made a rare foray into the opponent's half that saw the ball fall to Whitaker on the edge of the box which he side-footed into the vacant net. Three-nil, hattrick completed, four thousand eight hundred people breathed a huge sigh of relief, and the small band from the West Country shook their heads in disbelief. The visiting players then wilted, Ford's ability to nod in, unmarked, from six yards being symptomatic of that, and we looked good for at least another goal or two. That failed to arrive, though, but I’m sure everyone was more than happy with the result even if it, perhaps, flattered the home side. If this account appears to detract from a competant, often entertaining performance from Town then I apologise; it's not intended to. It's just that, overall, I felt it was far from the one-sided contest the scoreline suggests. I actually thought there were several huge positives from yesterday's showing: Whitaker once again confirmed what a class player he is; the same can be said of Griffiths; though obviously not yet fully match fit Morgan gave tantalising glimpses of potential; and both Boden and Bowery underlined their ability to contribute, albeit in cameo roles at this juncture. And the greatest positive of all is that we now seem to possess a credible squad that offers genuine competition for places. The Manager deserves a pat-on-the-back. Other stuff: excellent atmosphere at times, and it really is encouraging to witness kids - and sometimes adults - in the Family Stand making as much noise as the South Stand. Thus far the 'b2net' has actually added to, rather than nullified the crowd reaction: long may this be the case. Furthermore the attendance gives us great hope for the future. It's still the holiday season, with several contributors to this forum admitting they'd be absent for this fixture, yet the gate was just a shade off five grand - probably fifteen hundred up on what we could've expected at Saltergate. Again, long may this continue. On the negative side, though, it's a concern to see a long queue for tickets at five to three on a match day. I'm not gonna point the finger at anyone in particular here, but the simple truth is paying customers will be put off if this continues. And it's no good making pious statements along the lines of 'they've had all week to get one' or 'they should've come sooner': as has been said before, there'll always be those who decide to attend at the last minute and/or aren't fully conversant with the new arrangement - would it really be the end of the World to have just one cash turnstile at each end? Those of us who travelled to Chesterfield yesterday found a brand new stadium, quite easy to get to, with reasonable facilities. And perhaps with a little more character than say that at Shrewsbury. The stadium reportedly cost £13M and the curved structure of the stands made it somewhat different. But one couldn't help feeling that not enough thought had gone into the ticket office which simply didn't have enough 'tills' for all the supporters both home and away. Yesterday it was mainly dry in the hour before the game, but it wouldn't have been the best of experience to have stood out in the open on a winter's afternoon with the wind howling and the rain pouring down to purchase a ticket. The well set out and stocked club shop was busy. Probably the reason a steward was on the door ensuring not too many fans were allowed in at the same time. One plus factor was that Chesterfield, like Hereford, do not have the services of Lindley Catering. The refreshments were quite reasonable. As regards parking Chesterfield have a permits only system. So no parking at the stadium for away fans unless pre-booked. However just across the road was a Fitness First car park which allowed easy access and departure. In fact Chesterfield do not allow cars out of their parking area until spectators have left which could mean quite a delay. 'I finished off by asking Janos about the questionable fancy dress outfit he wore to a Christmas party a few years ago. 'He was dressed as Tina Turner and trust me he went for it. 'He had high heels, stockings, a massive silver wig, a glittering really short dress, and a pair of breasts Dolly Parton would have been proud of. Finally a couple of seasons ago on a wet and windy Monday evening Chesterfield defeated Hereford 4-0. That season the Bulls gained promotion to League One. Here's a couple of paragraphs from our report of the match. As early as the second minute, Chesterfield took the lead when a surging run from midfield by Lester allowed him to put Lowry in for the first. In the fortieth minute, the game was all but over when Lester got his second. The ball was played in from wide on the right and the Chesterfield striker got the better of a defence desperately trying to hold it’s line on the edge of the box to finish with aplomb. The (second) half saw better possession for The Bulls but again they lacked thrust in the final approach. Tonight, too many individual battles were lost in all areas of the field and were it not for a couple of splendid stops by Wayne Brown, the defeat could have been worse. Hereford suffered their first League 2 reverse of the season when they went down by four goals to nil at Chesterfield this afternoon. As expected, O’Neil Thompson failed to make the squad and Simon Davey replaced him with playmaker Kenny Lunt but surprisingly stuck with the fragile 4-3-3 formation which allowed Spireites’ midfielder Danny Whittaker the freedom to help himself to a hat trick within an hour. The fourth was added by defender Simon Ford to top off a dismal afternoon for The Bulls. Chesterfield started with veteran Jack Lester up front but the aging hotshot who had long been admired for his footballing skills showed another side to his play today as he demonstrated all that’s bad about modern football with his shirt-pulling and deceitful antics to incur the wrath of the travelling United supporters. An early Bulls’ corner produced an effort from Kovacs but the big defender miss-hit his shot wide of the target. At the other end, Lester was penalised for a blatant push on Townsend then in the next attack handed off the attentions of Townsend before releasing Whittaker and his shot was turned around the post by Bartlett at the expense of a corner. When the flag-kick was curled into the box, Lester fell the ground in the six-yard box right in front of the visiting fans. The referee awarded a penalty and booked Canham for the challenge. As the saying goes…I’d like to see that one again, because from where I was sat right behind the goal, I saw nothing wrong. Bartlett protested and promptly joined Canham in the official’s notebook. Whittaker stepped up and converted the spot-kick high to the keeper’s right to give the home side a ninth minute lead. A smart move by The Bulls down the right involving Green and Colbeck saw the latter deliver a first-time cross from which Manset’s header was tipped over by Lee. Fleetwood then worked an opening for McQuilken but the midfielder could only blast his shot well over the bar. Fleetwood was blatantly elbowed as he attempted to clear upfield but the only action from the referee was to send him from the field to change his bloodstained shirt. Clearly, this was not going to be our day. Colbeck was prominent in several swift counter-attacks but his ventures into the Chesterfield final third was leaving the already short-handed midfield very exposed as Lunt and Quilks were left to fend off the attentions of a fully equipped Spireites central division. The frailties were further undone on 33 minutes when Whittaker was able to run unattended onto a Lester through ball and finish via a deflection passed Adam Bartlett. Captain Kovacs blocked a shot from Morgan and Allot lifted a shot over the bar before Colbeck found Fleetwood on the edge of the box and the striker’s effort beat the keeper but crashed against the crossbar and Canham was only able to head the rebound straight into the arms of the recovering Lee. The Bulls started the second period with renewed enthusiasm and no doubt hopeful that the officials might have realised during the interval that it was actually within the rules to allow decisions in favour of the visitors. There was an early opportunity when Manset, clean through on goal, was hauled down by the keeper with the goal gaping just ten yards away. A penalty and an obvious denial of a goal-scoring chance so it had to be a red card. Apparently not. The penalty was awarded but incredibly, Lee received a polite word, a yellow card and promptly saved Valentine’s spot kick. Kovacs was unlucky with a header that whistled just over and Fleets curled a shot just wide of the far post but with thirty minutes remaining, the midfield weaknesses were again exposed. A Bulls move broke down in the opposing half and the home side surged forward almost unchallenged. Bartlett palmed away as Lester advanced but the ball fell to the advancing Whittaker who scored into the unprotected net. The home side completed the scoring just a couple of minutes later when defender Simon Ford rose to head home a Whittaker corner. Davey introduced Daniel Stratford in place of Canham and later gave a run to Sam Malsom in place of Wee Jimmy but it was too late to effect the result. The Spireites were the better side but there was a feeling in the Printability Stand that we contributed a little to our own downfall by numerically conceding the vital midfield area. Lester caused problems with his underhand play that would surely have not gone un-noticed by a more observant referee but the real downfall stemmed from being overrun in the middle and the resultant failure to provide decent chances for the strikers. The game was watched by a reported 4970 with an estimated 300 from The Shire. Hereford: Bartlett, Green, Kovacs, Townsend, Valentine, Colbeck, Lunt, McQuilkin (Malsom 77), Fleetwood, Canham (Stratford 67), Manset. Subs unused; Connor, Kanoute, Weir, Rose, Gwynne. Chesterfield: Lee, Hunt, Breckin, Ford, Griffiths, Whittaker, Morgan (Boden 78), Allott (Niven 75), Mattis, Talbot, Lester (Bowery 67). Subs unused: Redmond, Gray, Clay, Darikwa. After the match, a large golden labrador, wearing a harness was seen tied to a lamp post outside the stadium. It is not known if it was the property of referee Mark Brown. England were defeated 5-1 by Brazil in the semi-final of the Blind World Cup at Hereford earlier today. Jonathan Gribbin scored England's goal. Our picture, kindly taken by Andy Compton of the Hereford Journal, shows the teams before the start. Click on the pic to enlarge. England will play China tomorrow at 1pm for third place. Spain play Brazil in the final. The Hereford United Youth team had a better day than their seniors. A 2-0 win over Yeovil, in conditions that became very wet towards the end of the game, gave the youngsters their first win of their season. Goals from Zac Brimble and Josh Hunt gave the Bulls all three points. Chesterfield manager John Sheridan was pleased with his sides 4-0 win over Hereford but still had a few kind words for his opponents. "To win 4-0 and keep a clean sheet is, hopefully, confidence boosting," Sheridan told Radio Sheffield. "Hereford are a strong team and they'll cause teams problems. We had to defend at times and I knew they would cause us problems if we gave cheap free kicks and corners away." Sheridan was asked to comment on the Hereford penalty. "I've seen keepers sent off for it but he made a geniune attempt for the ball. "I can understand that Simon (Davey) thinks he should have gone because I would probably have said the same. "I do think that if a keeper makes a genuine attempt to try and stop the ball he shouldn't be sent off. "The penalty save changed the game because it would have been totally different game at 2-1." Sheridan said he didn't see the reported incident involving Sean Canham. Hereford United manager Simon Davey said that the two penalties in this afternoon's game at Chesterfield changed the game. "They had a very soft one in the first five minutes," Davey told BBC Hereford and Worcester. "Sean (Canham) said he touched his back but he's gone down very easily. Referee's given a penalty. Then a deflected goal so we're 2-0 down and we're up against it. "We came out and had a head of steam. We got our penalty. I felt the goalkeeper should go in those situations which would have changed the game. "The keeper saved it. That changed the game. We lost our head of steam. They get another chance and it's in the back of the net. "You've got to hold your hands up and say their finishing was better than ours, and they defended better than us. "I've look at our games over the last couple of weeks and defensively we've been sound and the back four have looked really strong. "But today we've been at sixes and sevens and I've got to admit we didn't defend well enough. "I think we passed the ball better. I thought we created chances. We've hit the post, we've had a penalty. "But we've come away and not scored again. "It's one we are going to have to put in a drawer and hide away." All today's stats from Chesterfield's new stadium. Attendance 4970 with 219 in the away end. Not all the Hereford supporters were there at the end. Referee: Mark Brown was not consistent and missed an incident before the start of the second half when Hereford's Sean Canham appeared to be hit by a Chesterfield player. Marc Pugh scored for Bournemouth as they beat Tranmere. Craig Stanley was booked for Morecambe as they lost at Burton. Steve Guinan scored from the spot as Northampton drew at Bury. Mark Marshall was booked as Barnet were hammered at Crewe. Keith Lowe scored a late consolation for Cheltenham as they lost at Rotherham. John McCombe was booked for Port Vale as they beat Southend. Robbie Threlfall was sent off after just 12 minutes for a handball in the box as Bradford lost at Torquay. Alan Connell scored a late consolation goal as Grimsby learned about Conference football with a home loss to Hayes and Yeading. Danny Davidson scored twice as Boston Utd hammered Redditch 9-0. Jack McLeod scored the winner for Leatherhead as they beat Worthing. Alex Jeannin scored for Truro as they drew at Bedford. At the top Torquay are the only 100% side after they stretched their clean sheet record to 10 games with a 2-0 win over Bradford. Shrewsbury lost their 100% claim with a 1-1 home draw with Aldershot with Matt Harrold becoming their second red card recipient of the season. The Shrews are one of four clubs on seven points alongside Chesterfield, Rotherham, and Port Vale. The Millers came back from 3-1 down to beat Cheltenham 6-4 with Adam Le Fondre scoring four, while the Valiants won 3-1 at Southend. Burton beat Morecambe 3-2, and Bury drew 1-1 with Northampton. Everybody has at least a point on board after both Lincoln and Crewe collected their first points of the campaign. Crewe hammered Barnet 7-0 to drop the Bees to the foot of the table, while Lincoln took a surprise 1-0 scoreline from Gillingham. Macclesfield join Barnet at the bottom after a Sean McConville hat-trick saw the Silkmen beaten 3-0 by Accrington. Stevenage beat Stockport 3-1, and Wycombe drew with Oxford 0-0. In the Conference Wrexham lost again, 4-3 at Eastbourne, to further heap pressure on Dean Saunders. Luton won 3-0 at Fleetwood and Crawley won 1-0 at Altrincham. Forest Green drew 1-1 with Gateshead, while Kidderminster lost 3-1 at home to Mansfield. The Bulls came home pointless and goalless from Derbyshire, losing 4-0 at Chesterfield in today's League Two match. An early debatable penalty, the first of Danny Whitaker's hat-trick, set the tone for a disappointing day with the Bulls drawing a blank in front of goal despite being awarded a penalty for a foul on Mathieu Manset. Ryan Valentine's spot kick was saved. There were 219 Bulls in the crowd of 4,970. Port Vale's board have rejected Mike Newton's investment proposal. The board said the £500,000 offer was not convincing and that the off-field savings claimed were not achievable. Southend have handed trainee Merrick James-Lewis his first pro contract. The midfielder, who was previously with Fulham's youth side, has signed a two year deal. Accrington have signed defenders Leam Richardson and Andrew Owens on short term deals, and handed former Preston trainee Tom Smyth a one year deal. Richardson has proved his fitness after lengthy injury problems, while Owens comes from Glenn Hoddle's Academy side. Stanley have failed in a bid to resign Paul Mullin from Morecambe. The 36 year old has been on the bench for the Shrimps so far this season but he remains in their plans. Hereford United's noticable team bus has broken down en route to Chesterfield on the M5. It was last seen heading back towards Ross on the M50. Update: 11.40. A replacement coach from Yeomans has recently been spotted on the M42 with the team. Les McJannet, manager of Evo-Stik League Division One South club Carlton Town, has signed former Northampton, Hereford United, Cheltenham and Boston United striker Neil Grayson. "Grayson," says McJannet, "will still let the opposition centre forward know he is in a game and his experience will help our young side." Grayson, now 45, was purchased by then manager Graham Turner for £20,000. He made his first appearance for the Bulls in the Conference game against Welling on August 16th 1997. He almost averaged a goal every two games during his time at Edgar Street. Herefordshire is a county renowned for its beef, apples and of course cider. It's quite good at growing potatoes as well and converting them into premium crisps and even vodka. All good healthy foods! And many people work in manual type jobs and therefore probably use up more energy than average. So a recent study that suggests Hereford United supporters are the third fattest in League Football takes some believing. Stockport top the table with some 61.3% of their fans deemed to be over-weight. Rotherham are second with 58.3% and then Hereford United with 57.9%. The findings are part of an on-line survey conducted by the NHS Choices which had 25,000 replies. It's part of an initative called the 'Football Fan Fitness Challenge'. The aim is to encourage fans to become more active and, no doubt, lose a bit of weight. The survey was conducted during the summer break. This is just a short reminder to anyone wishing to enter the Bulls News Prediction League this coming weekend. To enter, simply send in your final score and attendance predictions for the upcoming trip to Chesterfield. Please remember to include your chosen username.